1999-2010 Ford® E-350 Super Duty Series 37 gallon rear/aft axle fuel tank. Tank includes our specifically designed sending unit gasket & stainless steel retaining rings for the sending unit and valves. Do NOT use the OEM sending unit gasket. 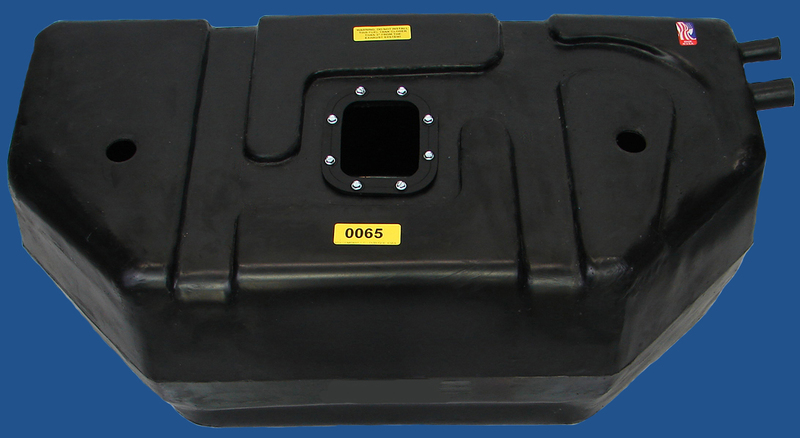 This tank does NOT include a sending unit, EMS valve(s), EMS valve gasket(s), straps or skid-plate. Dimensions 30 1/2" x 24 3/4" x 13 3/8". Replaces # 2C2Z29002GA, 4C249K087DD and F7UA-9002-CD. 1999-2010 Ford® E-450 Super Duty Cutaway & Stripped Chassis 55 gallon rear/aft axle DIESEL fuel tank only. Tank includes our specifically designed sending unit gasket & stainless steel retaining rings for the sending unit and valves. Do NOT use the OEM sending unit gasket. This tank does NOT include a sending unit, an EMS valve, EMS valve gasket, straps or skid-plate. Dimensions 36" X 31" X 13 1/4". Replaces # 3C3Z-9C968-AA. 2011-2015 Ford® E-450 Super Duty Cutaway & Stripped Chassis 55 gallon rear/aft axle fuel tank. Tank includes our specifically designed sending unit gasket & stainless steel retaining rings for the sending unit and valves. This tank does NOT include a sending unit, an EMS valve(s), EMS valve gasket, straps or skid-plate. Dimensions 34 1/2" x 29 1/2" x 15 3/4". *2011-2015 Ford E-350 Super Duty w/ 138" & 158" WB had a standard 40 gallon rear/aft axle tank however the 158" WB had a factory option of a 55 gallon fuel tank. Verify which tank you have before ordering this tank. 4249 1973-1979 Ford® Full-Size Pickup 19 gallon tank with one 2 1/4" hole for the sending unit w/ fuel pickup tube. Fits pickups with long wheel base regular cab and most crew cab with side tank. Our tank replaces the original metal tank NOT the original plastic tank. Not for Super Cab Models or the 1967-1977.5 Ford "High Boy" Pickup. Includes new lock ring and O-ring. Length: 55". Replaces # D8TZ9002J. 4249A 1973-1979 Ford® Full-Size Pickup 19 gallon tank with two 2 1/4" holes for the sending unit and fuel pickup tube. Fits pickups with long wheel base regular cab and most crew cab with side tank. Our tank replaces the original metal tank NOT the original plastic tank. Not for Super Cab models or the 1967-1977.5 Ford"High Boy" Pickup. Includes new lock ring and O-ring. Length: 55". Replaces # D8TZ9002K. 4250 1973-1979 Ford® Full-Size Pickup 19 gallon tank with EMS hole on top. Fits pickups with rear mounted tank behind the rear axle. Vent pipe is toward the front of the truck. Includes new lock ring and O-ring. Dimensions 25½" x 32½" x 8". Repalces # D8TZ9002B, DSTZ9002P. Will NOT fit on the 1967-1977.5 Ford "High Boy" Pickup. 4250A 1973-1979 Ford® Full-Size Pickup 19 gallon tank without EMS hole on top. Fits pickups with rear mounted tank behind the rear axle. Vent Pipe is toward the rear of the truck. Includes new lock ring and O-ring. Dimensions 25½" x 32½" x 8". Replaces # D8TZ9002M. 4216B 1980-1984 Ford® Full-Size Pickup 17 gallon tank fits short and some long wheel base with side tank. Includes new lock ring and O-ring. Length: 40". Replaces # E0TZ9002L. 4252B 1980-1984 Ford® Full-Size Pickup 19 gallon tank fits pickups with side tank (long wheel base). Includes new lock ring and O-ring. Length: 56". Replaces # E3TZ9002M. 4252 1980-1984 Ford® Full-Size Pickup 19 gallon tank fits pickups with rear tank behind axle. Includes new lock ring and O-ring. Dimensions 25½" x 32½" x 8". Replaces # D7UZ9002L. 4252A 1985-1996 Ford® Full-Size Pickup 19 gallon tank fits pickups with long wheel base 2WD with side tank and most 4WD. Includes new lock ring and O-ring. Length: 56". Does not fit 1997. Replaces #'s EZTZ9002L, F6TZ9002A, F6TZ9002N, E8UZ9002C. 4253 1985-1997 Ford® Full-Size Pickup Truck 19 gallon rear tank mounted behind the rear axle. This tank does NOT have a a vent pipe, but it does have an EMS hole on top of the tank. Includes new lock ring and O-ring. Dimensions 25½" x 33½" x 7½". Replaces #''s E5TZ9002E, E7TZ9002A, F3TZ9002A. 2000-2010 Ford® F350-F550 Super Duty Series "Diesel Only" 40 gallon rear truck tank. This tank replaces the 6 Bolt style sending unit, not the lock ring style. Each tank includes our specifically designed sending unit gasket(4740A-OR), 6 new bolts with a tube of thread sealer and a sending unit hold down ring. When installing the sending unit, coat each screw with the thread sealant. Do NOT use the OEM sending unit gasket. This tank does NOT include a sending unit, an EMS valve or an EMS valve gasket. 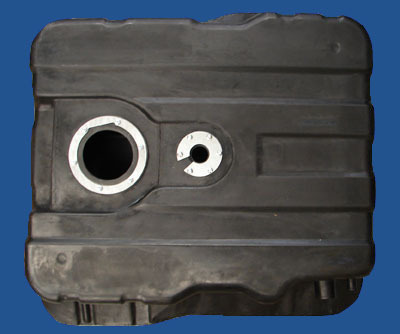 Our tank replaces OEM tanks #'s: XC3Z9002AA, 6C3Z9002BA, 6C3Z900-2A, 6C3Z9002E, 6C3Z9002F, 3C3Z9002AA, 5C3Z9002BB. Trucks with F53 in the fifth, sixth and seventh VIN positions and have fuel tanks with OEM tank #'s 1C34-9K007-F*, 1C34-9K007-G* and 1C34-9K007-H*, are an inch shorter in length and have a larger filler pipe diameter. Our MTS tank will fit, but some custom adjustments to the straps are required. 2011-2016 Ford® F350-F550 Super Duty Series "Diesel Only" 40 gallon rear truck tank. Each tank includes our specifically designed sending unit gasket(4740L-OR), 7 new bolts/washers, a tube of thread sealer & EMS valve plate w/ 6 bolts. When installing the sending unit, make sure the fuel bowl sits properly in the bottom of the tank and use the original lock ring to hold the sending unit in place with our seven bolts(See picture #2). Make sure to coat each bolt with the thread sealant. Do NOT use the OEM sending unit gasket. This tank does NOT include a sending unit, an EMS valve, EMS valve gasket, straps or skid-plate. 4740E 1999-2010 Ford® F350-F550 Super Duty Series "Diesel Only" 40 gallon truck tank. This tank replaces the Lock Ring style sending unit hole, NOT the 6 bolt style. Does not include sending unit, sending unit gasket, EMS valve or EMS valve gasket.